Institution Elettra synchrotron facility – Sincrotrone Trieste S.C.p.A. 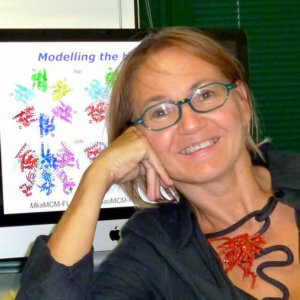 Silvia Onesti obtained a PhD in Biophysics under the supervision of Peter Brick and David Blow, and then returned to Imperial College London, to set up a laboratory focussing on the structural and functional analysis of proteins involved in basic genetic processes, such as translation, transcription and DNA replication. Since 2009 she moved to Italy as Head of the Structural Biology Laboratory at the Elettra synchrotron facility. The main focus of the laboratory is the study of proteins and protein complexes involved in the process of DNA replication and DNA repair in eukaryotic cells. These are crucial events in the cell cycle, underpinning cellular processes with important consequences such as cell proliferation, aging and genome stability.